“’Tis advertised in Boston, New York, and Buffalo. He’s got the lyrics wrong; it’s "500 brave Americans," and I smile because he’s adorable. But then I think, "Wait, though! 500. Brave. Native Americans!" In US history classes, kids like Will hear about the bravery of non-Native "explorers"/"discoverers"/Pilgrims/settlers/revolutionaries/pioneers/frontiersmen/the US cavalry. Sure, they may hear Indigenous men referred to as “braves.” But will they learn about 500 specific, courageous Native people? Or 100? Or even … five? You know whose names they’ll hear, of course – Pocahontas. Squanto. Sacagawea. Crazy Horse, Sitting Bull, Geronimo. In other words, they’ll learn about some Native people who are viewed as helpful to the colonizers, and some of the ones who fought colonization of their homelands. Will (who's now 12) tells me that he and his classmates definitely don’t hear about contemporary Native people whose courage and commitment make a difference NOW in their communities and in the wider world. But we know that all kids benefit from the affirmation that Native people ARE STILL HERE and are deeply INVOLVED in the heavy lifting to make the world a better place. It would be Something if, by the time they graduated high school, every student in the US could name a couple dozen Indigenous people who've made a positive difference. Native kids, of course, may have first-hand knowledge of family members who are writers, artists, activists, scientists, and so on. But it's challenging to find reliable information for young people about noteworthy contemporary Native people. Biographies tend to be problematic. Most are not the work of Native writers. Though supposedly factual, they often contain the same biased language and distorted window on Native lives often seen in fiction. And they're usually about figures in the distant past. An important exception is the Native Trailblazers Series for teen readers. It’s put out by 7th Generation Press. Each book features 10 or so profiles of significant people or groups, most of them still living. 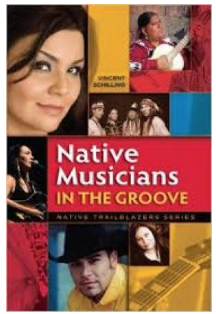 I haven’t read them all yet – but I feel confident in saying that the Native Trailblazers series is worth a look.